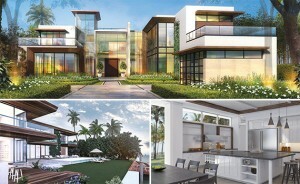 New York real estate tycoon Peter Fine’s first spec home in Miami Beach is set to hit the market in the next week. Located at 6440 North Bay Road, the 15,000-square-foot mansion, priced at $30.5 million. The seven-bedroom, eight-bathroom estate is currently under construction, with completion expected in November. The home will have a 2,500-square-foot roof deck, an expandable garage for up to six cars, 12-foot tall sliding glass walls, and 100 feet of frontage on the bay. Fine recently launched To Better Days Development, with a goal to develop ultra-luxury waterfront mansions on the North Bay Road and on Miami Beach’s Palm Island. So far, the firm has purchased four sites in Miami Beach, including 6010 North Bay Road, a formerly vacant lot which is currently under construction and expected to be completed in 2016: 158 Palm Island, which was also a vacant lot; and 6342 North Bay Road, which the firm purchased in May for $9.5 million. Miami Beach’s North Bay Road waterfront has attracted such celebrities as Ricky Martin, Matt Damon and Jennifer Lopez, whose former home at 5800 North Bay Road was purchased last month for $33 million by Phil Collins. Calvin Klein last month announced he was selling his home at 4452 North Bay Road for $16 million. And the founder of Chicken Kitchen listed his under-construction home at 5004 North Bay Road for $36 million. To Better Days Development’s spec homes all will have more than 10,000 square feet. The mansions are being designed by Choeff, Levy & Fishman, with landscaping by Enea Gardens Design, said Fine, a part-time Miami Beach resident who has a waterfront home on North Bay Road. Contact Martina today regarding this North Bay waterfront home or search to find your dream home in Miami Beach or the Miami area. Martina knows these neighborhoods best! Call or email her with your favorites & she’ll provide you with all the information that suits your needs & lifestyle.